To say that the sands of time hold within their shimmery, golden brilliance countless secrets would be stating the obvious. Deserts are places of great mystery what with their vast, undulating landscape, coupled with the eerie silence that dusk bestows upon them even as the moon illuminates every curve and crevice. But there is one little secret that the Sam Desert of Jaisalmer is begging to be exposed! A secret that speaks of ultimate luxury and relaxation; a secret with very strong underpinnings of complete wellness—the Rait Spa. 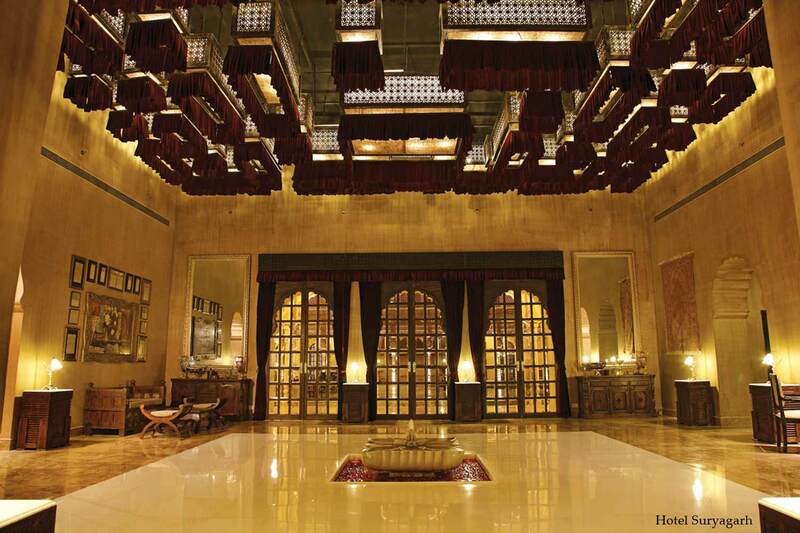 Named in honour of the sand that seems to be everywhere in Jaisalmer—Rajasthan’s ‘Golden City’ as it were—this spa is part of Suryagarh, a majestic hotel that encapsulates the regal spirit and romance symbolic of this land. The Rait Spa wing of the hotel itself is a wonderful mélange of the ancient heritage architecture style with its intricately carved jaali screens, mother-of-pearl inlaid marble, sandstone flooring and modern fittings in its five therapy rooms like steam cubicles and in-built whirlpools. The spa garden flanking the structure is an oasis of calm so imperative for post-therapy ‘blissing-out’ amidst birdsong and the gurgling of the ornamental fountains. After a quick scan through the rather exhaustive spa menu, over a warming cup of lemongrass and ginger infused green tea, I was ready to indulge. And in keeping with the whole royal mood of my stay at Suryagarh, I opted for a trio of treatments at the Rait Spa with a two-pronged agenda. One, I wanted to feel pampered like a maharaja of yore. Two, I wanted to re-connect with wellness, something my stressed out urban existence was sapping out of me. For the first part of my treatment—the 120-minute Thermal Sand Body Massage and Scrub [`7,000]—my body was anointed with a heady spice scrub that my therapist told me consisted of a blend of Kerala vanilla, cardamom and mace. With this ointment coaxed into my every pore, the dead accumulated skin was slowly sloughed off with every deft stroke. The exfoliation session was then followed up with an hour-long massage that employed the use of small heated potlis [bundles] of Jaisalmer sand that, I was told, helped in relieving stiff muscles. And give relief it did, as I felt the nagging soreness in my neck ease away into oblivion and the knot in my lower back undo itself, thanks to all the thermal attention it was getting. The third part of the therapy was a henna [lawsonia inermis] and khus khus [vetiver] potli rub that was the ideal treatment for stress and exhaustion, I was informed. The bundles help by opening the pores further, so that they can release a deep medicinal heat to the muscles to relieve tension and revitalise the body, all the while focussing on the eastern theories of energy meridians. Well, I don’t know about any energy meridians, but it sure worked on me and had me feeling totally rejuvenated and ready to face the world a brand new man. Speaking of face, the second therapy I was booked in for was the rather aptly named Rajputana Facial [`2,950]. This 60-minute therapy was a gentle journey of cleansing, exfoliation, massage and toning that began with the application of a paste made from almonds [a good source of vitamin E and proteins] and rose petals [known for their re-hydrating properties]. As my skin is on the drier side and prone to a bit of flaking, this was perfect. I could feel the tautness all over my face vanish as the almond-rose paste worked its wonders. The facial was then finished off with the application of a pomegranate toner as the ruby-jewelled fruit is well-known as an excellent astringent. For the grand finale and curtain call for my afternoon of pampering, I had chosen to soak my body in the Bayra Bath [`4,450] for an hour. Inspired by the Ayurvedic Abhyangam, this bath had in its warm waters an added mixture of melted honey and lavender extract that was gently rubbed into my skin. Like rose petals, honey too is known for its skin re-hydrating properties, while adding a protective layer. Lavender on the other hand, I learnt, aids in balancing the skin’s natural pH balance while relieving pain and nervous tension. But tension was the last thing on my mind after all that pampering and wellness that my body was subjected to. Bliss had taken over and my every cell was celebrating its sweet victory! This was first published in the September 2013 issue of Complete Wellbeing. Raul Dias is a luxury, fashion, international lifestyle, food and travel writer since over a decade. He is a food consultant for many restaurants and hotels. He also conducts travel writing workshops.